5 Acres & A Dream: Figs! hhmmmm... that cake looks really yummeh! lucky you - we have a few figs outside in the garden, one in the glasshouse - but they never fruit or at least, if they do set one or two - they drop off and don't ripen! :(( they survive the mild winters, but apparently they'd need a bit more warmth and sunshine during the summer than they can get over here. amazing, that you even have enough to can or dry them! It all looks so yummy! I'll admit, I don't like figs and the 18 months I survived er lived in Los Angeles, there was a fig tree in the back yard. It was a messy tree. That cake looks good enough to give a whirl though and revisit a fig or two. I didn't know that you could make so much out of figs! I've never had a fig but your cake looks yummy! This looks so delicious! Fresh figs make me think of Italy. What a wonderful garden you have with figs and blueberries: all the best combined from North and South! When we were in VA a few years back I was able to point out the fig trees at the Governor's Palace in Williamsburg to DD..she wasn't impressed, but I was. I never found out what they do with all the veggies they plant in that garden as they aren't needed to run the palace. LOL! It looks as if you found some really good ideas for what to do with your figs and that cake looks sooo yummy! 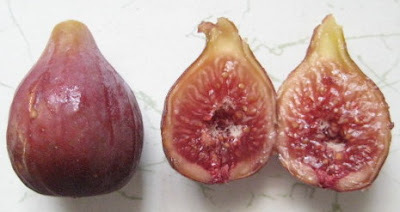 I couldn't happen upon a post on figs (quite possibly the world's most perfect fruit) without commenting. 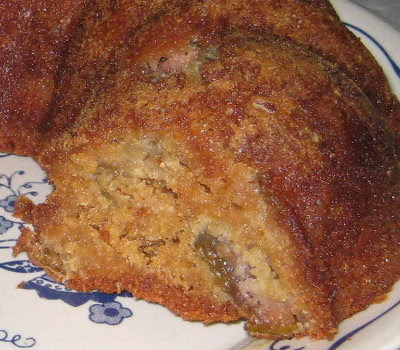 Lovely photos and thank-you for sharing the recipe and links! Just thought, maybe we have a plant that loves our climate you can't grow, rhubarb? Other reliable all weather plants for the north of England include red and white currants, and gooseberries. Do you have any of those? I know for quite certain that I've never had a fresh fig. I don't think they even sell them in the stores here - at least I've never notices them. But I do like Fig Newtons - so I can only imagine that all the stuff you made with them will be tasty. T.
I've never eaten fresh figs. They sure do look good. Glad to see you're using them in so many different ways. Thanks for the cake recipe. Sounds and looks great. One of the things that I've learned about figs is how many different kinds there are. I'm used to the fig newton kind too Tina, and so was surprised that mine turned light green and yielded a pinkish cooking water! Theresa, the kind of fig may make a big difference in it's likability. Bettina and Dorothy, its interesting that you can grow fig plants but can't get fruit without a protected environment. Dorothy, one of the things I'd love to grow but am not sure about is rhubarb. My grandmother grew it in her garden and my dad loved it stewed. I suspect that our summers are too hot for it, but I may give it a go sometime anyway. 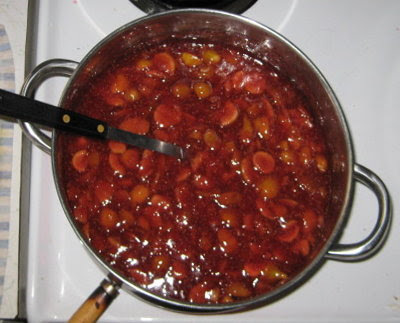 You're probably correct about the currents and gooseberries, though I'm not as tempted to try those as rhubarb. And for those of you who've never tried fresh figs, this is a "must" at least once in your lifetimes! The wonders of life never stop...look at all you have done with the figs!! 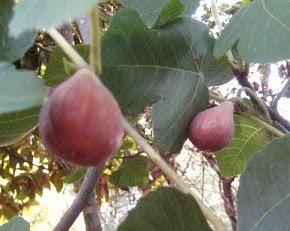 Each pictures is beautiful and you have caught the mouth watering essence of the fig!! Those figs are beautiful and the cake looks delicious. I'll have to try it. I've never canned figs and I'll be interested to learn how they came out and how you use them. My grandmothers both had fig trees...I guess I need to plant some now. Flower, thank you! It's been a lot of fun and my only regret is that I didn't have more to experiment with. Now I'm curious as to how the canned and dried figs will turn out. 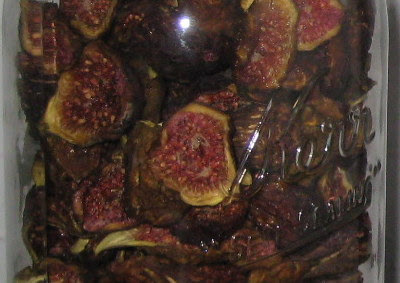 There are tons of recipes out there for dried figs. The hardest part will be choosing the ones to try. 13moons, you definitely need to plant some fig trees! 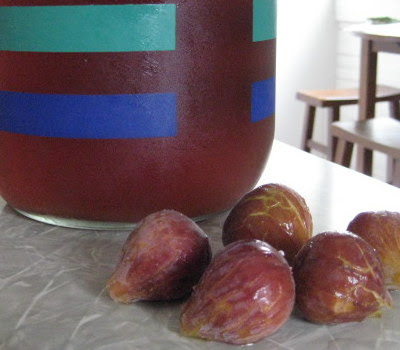 You probably have some favorite memories or recipes from your grandmothers' fig gathering. Sugar syrup: 1 cup sugar dissolve into 1 cup water and 1 tablespoon glucose syrup. Mix together with some lemon juice and put in ice cream maker. Add lemon juice to taste. It can get a bit sweet depending on the figs. Remember that it will be sweeter before it is frozen. This proportion pretty much works for most fruit - apricots, plums, mangoes, etc. Loved this recipe. Didn't love the figs so much. I actually made this gluten free. I will be making this again this week but without the figs. We are just not a fan of figs in a cake. (I found this out later) I did add a tablespoon of sour cream and a tablespoon of cream cheese and I sifted the flour. It was awesome! Renee, I hope it was as good as ours! Bondi, I think you could substitute anything you wanted. Dates would be good! Or blueberries, or cherries! The sour cream and cream cheese sound like a yummy addition! Bea, welcome and thank you! I have to say that your mention of fig tarts sounds pretty good too!